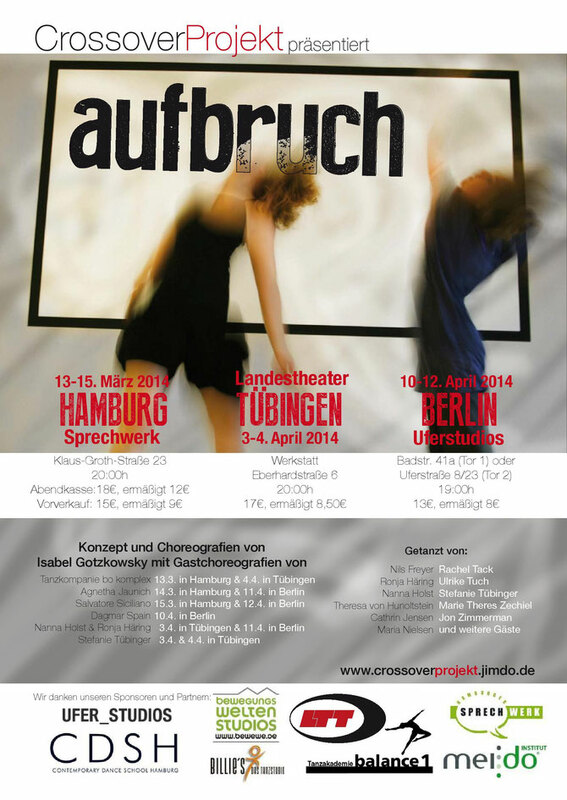 Isabel Gotzkowsky and Friends & the Crossover Projekt - crossoverprojekts Webseite! Welcome to the website for our artistic project, The Crossover Projekt. The Crossover Projekt was created in Partnership with and under the umbrella of Isabel Gotzkowsky and Friends, a New York not-for profit dance organization and the Tanzakademie balance1, located in Berlin. We are excited that you are interested in the project and hope that you will visit this site often. Since November 2013 we have been working hard, getting this project going and we consider ourselves very lucky to be working with some wonderfully talented dancers as well as collaborating with great artists. Our premiere took place in March of 2014 in Hamburg, with additional performances in Tübingen and Berlin in April. We performed to full houses and received wonderful feedback about the work, the performances and the concept of the project. It didn't end there: For the first incarnation, we were able to secure four more performances: We performed in Prague, collaborating with guest choreographer Dagmar Spain, in September, followed by participation at the Kemptener TANZHerbst in Mid-October, finishing with a performance at Tanzprobebühne marameo in Berlin on November 1, all in 2014. The program for the second round of performances included a new guest choreographer: Todd Courage from San Francisco, who came to Berlin in early May 2014 to set a brand-new piece on 6 Crossover dancers. In November 2014 we held auditions for dancers to work with us in 2015, the second year of the project. This year we are working with 8 dancers and 5 guest choreographers, including 2 alumni from last year, Theresa von Hunoltstein and Nanna Holst, who were part of the project as dancers in 2014. 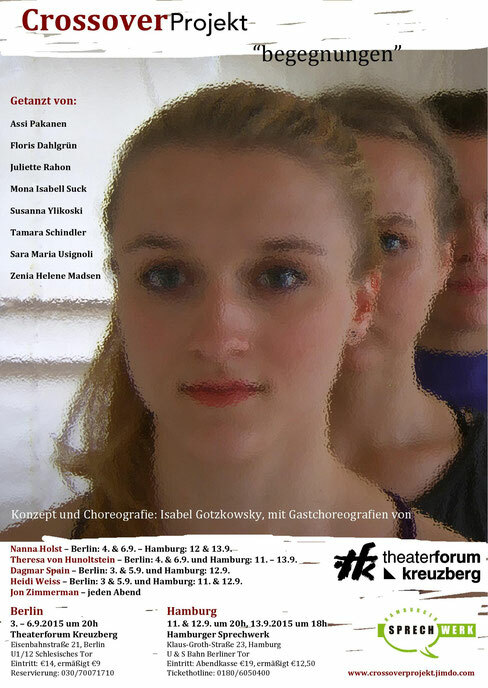 We are proud to present the work in seven performances in Berlin and Hamburg this coming September. Thank you for your interest! We hope to see you at one of our shows. Isabel & the Crossover Team.